There was a surprise movie night earlier this month on December 13th that I never posted about. I really meant to, but like I said in a previous post, there was an unexpected holiday hiatus with everything that was going on. Sorry about that folks. 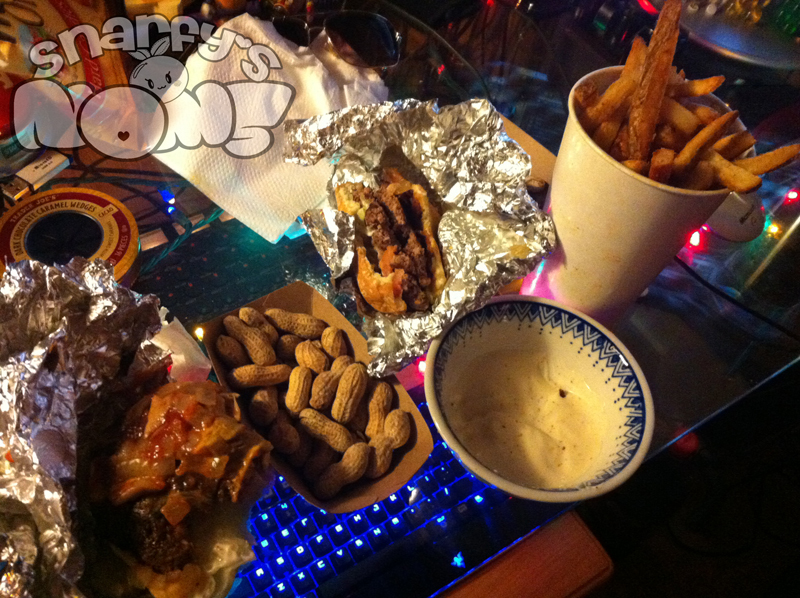 The 12/13 movie night was unplanned and so was dinner. Didn’t take much work to talk Archaellys into some Five Guys burgers and fries. I usually get a little hamburger all the way in a lettuce wrap. Arc went all out with a regular bacon burger, so I decided to one up it with the large Cajun fries (usually we split the regular size), which we dipped in ranch dressing. Don’t forget the peanuts – the guy actually gave us a bag for them so we might have loaded up. That’s only one little tray you see in the pic. Totally a cheat day for me, no question about it. And I might have picked up a tin of the dark chocolate caramel wedges when I was at Trader Joe’s that morning before work. They may or may not be absolutely delicious.